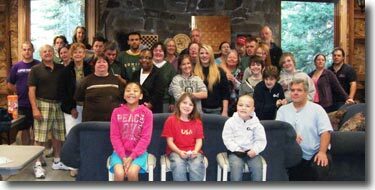 Prime Time serves families that have a member who is disabled or has a terminal/serious illness. A wide range of disability types are found among the children and adults who utilize Prime Time. 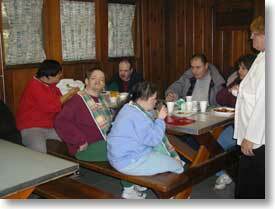 A very large number of the campers with disabilities are under the age of 10 years. Through remarkable advances in medical science and human service in recent years, individuals with serious diseases, birth defects, and disabilities now have substantially increased chances of survival. Accompanying this increase in survivability, is an increase in the number of people needing expensive treatment and long term support services. Along with the gratification of improving the quality of the individuals' time with the family, there is often the contradiction of ongoing physical and emotional stress. Finding ways to reduce that stress is a constant quest for families dealing with these issues. Inherent to the situation of the families of the terminally/seriously ill or disabled, are the barriers to participation in leisure activities. Public facilities are not always accessible or safe. Public attitudes can also be a deterrent to the use of public parks or recreational sites by a family with a special needs child. In many cases, the membership costs to participate in private recreational programs eliminate access for these families. Recreation which occurs away from the home environment provides many benefits. This is why an increasing number of recreational programs are being designed for children who are ill or disabled. Unfortunately, there are very few programs designed for the entire family...the members of whom may be suffering great emotional pain as they attempt to deal with the care of their loved ones. Prime Time is dedicated to providing a positive intervention in this dilemma. It is Prime Time's purpose to offer an opportunity for families dealing with illness, birth defects, disabilities, and disease to become reacquainted with each other, free of the stress and routine often found in the home environment. Prime Time offers families the chance to enjoy one another's company in an invigorating environment, surrounded by nature. Prime Time serves groups of families from across the Pacific Northwest. 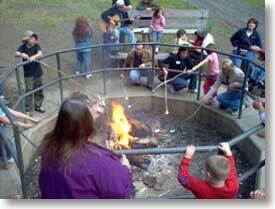 Campers come from throughout Washington State, including the counties of Island, King, Kitsap, Lewis, Mason, Pierce, Snohomish, Thurston, Benton, Clark, Columbia, Cowlitz, Franklin, Spokane, and Yakima. We also had some campers from outside of Washington - from Oregon and as far away as California and New Jersey. Generally, campers from eastern Washington represent about 30% of the total in attendance each year, with 65% coming from western Washington. 5% come from other states, predominantly Oregon and Idaho. *This total includes campers and their family members that stay with them over the weekend. 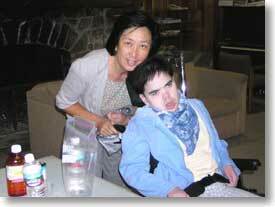 A wide range of illnesses and disabilities are suffered by the families who participate in Prime Time camps. 80% of the family members with a disability are under the age of 10 years old. Very mature for their young years, these children often return, looking for the friends they made in previous years. Special Families of Pierce Co.